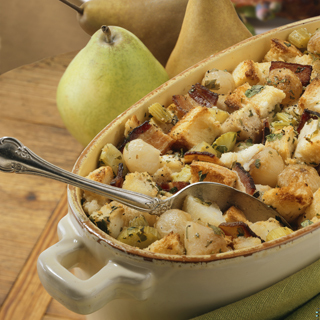 With sweet and savory elements, this hearty stuffing complements a holiday turkey perfectly. Nutrition Highlights: The pears in this side dish are naturally sodium-free, cholesterol-free, fat-free and contain high amounts of potassium. Coat a deep 9-inch-by-13-inch baking pan with butter. Place the bread cubes in a very large mixing bowl. In a 10-inch saute pan, cook the bacon over medium heat until crisp. Using a slotted spoon, drain the bacon and add to the bread. Remove all but 2 tablespoons of the bacon fat from the pan, reserving the extra. Add the onions to the pan and saute over medium-high heat, stirring frequently, until soft and lightly browned, about 3 minutes. Sprinkle the sugar over the onions and saute, stirring constantly , until the onions turn golden and the edges caramelize, about 3 to 5 minutes. Add to bread mixture. Return the pan to medium heat, add 2 tablespoons of reserved bacon fat and swirl to coat pan. Add the pears and celery and saute, stirring frequently until softened, about 4 to 5 minutes. Add the parsley, thyme, sage, salt and a few grinds of pepper and saute 1 minute longer. Add this mixture to bread mixture and stir to combine. Add the beaten eggs and stock to the bowl. Mix well. Place the stuffing in the prepared pan and bake, uncovered, until top is lightly browned and crusty, about 1 hour. This stuffing is great for leftovers. It tastes just as delicious when re-heated.